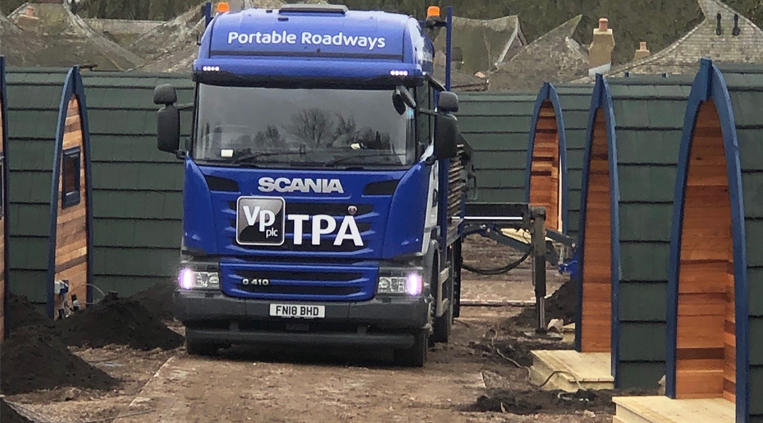 Home Media Hub Articles News 2019 Aluminium and plastic panels from TPA Portable Roadways help out at Alton Towers Resort. TPA’s aluminium and plastic panels have been enabling plant including three-tonne dumpers, five-tonne diggers and an 18-tonne mobile crane move and lift more than 100 1¼-tonne wooden pods into position on a site next to the resort’s Enchanted Village. They were delivered to site in November from TPA’s head office site in Worksop, Nottinghamshire, and the project is due for completion shortly.